Not enough people know how to use foursquare, but they should learn about it, since the site has been gaining popularity and because it can help businesses. Foursquare is a social guide that people can use to recommend places based upon the user’s activity, activity of the user’s friends, and activity of other foursquare users. Users must use a phone to “check in” at many places, including bars, restaurants, parks, museums, and grocery stores. To start using foursquare, the user needs to download one of the mobile apps onto a phone. The have apps for iPhone, Android, and Blackberry. Unofficial apps are available for Nokia’s S40, S60, and MeeGo platforms, along with Windows Phone 7 and Palm. 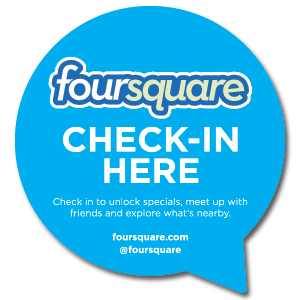 If an app doesn’t exist for your phone, you can check in through Foursquare’s mobile site or via SMS. To check-in, at each location, the user opens the app, on the phone, and Foursquare uses the phone’s GPS to find the phone’s location. Click the “Check in” button or tab, to find a list of area locations where you can check in. If that location isn’t on the list, you can add it. When you check in, you can share that information with Foursquare friends, as a facebook status update, and/or as a twitter tweet. The Explore button gives recommendations of places it thinks you’d like to visit. The recommendations are based on places you’ve been, placed that have been visited by your Foursquare friends, and places that have been visited by foursquare users who visit places similar to places that you visit. Foursquare has more than 15 million users and about 3 million check-ins per day. More than 500,000 businesses use foursquare. More business owners should encourage its customers to use Foursquare, since the check-ins will be seen by other users, providing inexpensive advertising for the businesses. The person who checks into a business the most is the mayor, and some businesses give discounts or reserved parking spaces to mayors. This encourages customers to check in, at those businesses. When they do that, more of their foursquare friends, facebook friends, and/or twitter followers read about the check-ins.